very understanding of questions that I had; plus was able to present x-rays for me to compare with the most recent.I could definite see the need for the services the doctor recommended. As a senior, I truly appreciated that Archie L.
very understanding of questions that I had; plus was able to present x-rays for me to compare with the most recent. I could definite see the need for the services thedoctor recommended. As a senior, I truly appreciated that Archie L.
I had a dental emergency and her staff schedule me right away I'm so thankful for her service. She did aawesome job gave me a temporary cap Her personality is great. I had a dental emergency and her staff schedule me right away I'm so thankful for her service. She did a awesome job gave me a temporary cap Her personality isgreat. ** Patients booking a dental consultation will be seen by Dr. Johnson and do not include a cleaning. If you'd like to book a dental cleaning, please select that as your visit reason and you will be seen by our hygienist! ** Dr. Quanda Johnson always wanted to be a dentist. Even as little girl, when she talked about careers, she drew a picture of a tooth and spoke to the class about being a dentist. Maybe it's that long-time passion that keeps her patients coming back. "It's a blessing, to know what you want to do and be able to do it". Dr. Johnson says, Her love of dentistry and care for her patients has made her dental practice warm and personal. "There's not a patient here that I don't know personally and I work hard to keep it that way," Dr. Johnson adds. That often includes being on the guest list for graduations, Christenings, and other family events, and even being first to call by a young patient when their tooth falls out. Dr, Johnson took over the practice in May of 2001, before she got married and had her children. This family dynamic has been important in her practice and many patients have seen her through her pregnancies. Our model is "We cater to the whole family"! I love the service that I receive and the knowledge of the staff about my dental procedures ?? Wonderful team of people. Great experience. Clean and effective care. I had an emergency and was seen on the day that I phoned, very short wait time. Dr. Johnson and her entire staff are truly one of a kind! She is an amazing professional and I love the services and staff at this office. Dr. Johnson and her staff were great! I would highly recommend them to my friends, family and colleagues. Starting with Jill ,warm greeting and concern evident. Does gr8 with follow throu of Plan of Care. Roxy, calms me down and brings me back successfully. Always makes me feel welcome! Dr. Johnson knows her stuff and want touch your teethif it's not her area of expertise. Sometimes I wish she would cause I trust her skills. I've had bad experiences in the past, wish I had the team in my lyfe years ago!?? 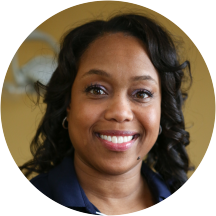 Quanda has a great personality to go along with her professionalism, as a Dentist. Jill is the first person you meet and she is friendly and helpful. Her other office staff are great also. Mrs. I had been having problems with a tooth and was told by 2 dentist prior to my visit with Dr. Johnson that it was due to grinding or pressure from chewing. One dentist saw the redness, swelling and said the toothwas loose. Went to Dr. Johnson and was immediately told abscess and cracked. That did it for, I will never go to anyone but Dr. Johnson. I have the biggest fear or the dentist, but her and her staff are the best. The entire staff was very friendly and professional. I hadn't seen a dentist in a very long time. The staff took time to listen to my fears and concerns. They made me feel comfortable and I am very satisfied with theservice. I will continue using Dr. Johnson for all my dental needs. Thank You. My visit with Dr.Johnson was very comfortable. Dr. Johnson runs a very professional establishment. Her staff made me feel at home and relaxed being I haven't been to the dentist in a long while. I highly recommend Dr.Johnson to my friendsand family. Check her out for future dental work she's the best hands down in my book!!!! Like always my visit to Dr. Johnson office was great! They really make you feel comfortable & they're extremely professional. I highly recommend her! She's the best! Simply a breath of fresh air. Excellent in service and customer care. She takes time to explain everything procedure and the visit isn't rushed. I am trying to get the rest of my family to change their dentist. I went to see Dr. Johnson to have two teeth filled and a broken tooth extracted. I was fine with the fillings but I was very nervous about the extraction. Both the Dr. and Roxanne were kind and disarming, theytold jokes to help me relax but remained professional; the tooth came out without incident and with virtually no pain. Hours later when the numbing medicine wore off I took two Aleve and had no further issues. I love this place and everyone that works there. ZaNetta S.
I am cry afraid of the dentist. I actually have a phobia and suffer panic attacks every I go to the dentist. I was referred to Today's Smile by my sister and 13yr old nephew who said this was the placeto go. They were right! Dr. Johnson and staff were so understanding and gentle with me. I had a hole in my wisdom tooth exposing a nerve. (Scary right!) Dr. Johnson and staff were so gentle that I didn't hurt at all and they suppressed my anxiety. I'm definitely going back and have already referred her to my daughter for my grandson. Thank you Today's Smile?? Everyone was professional, from the receptionist, the assistant and Dr Johnson herself. Very attentive treatment; I felt comfortable and cared for. I always enjoy my visits with doctor Johnson . She is pleasant,courteous, and she cares about your teeth. She has skill along with her pleasant personality. Dr. Johnson and her very capable staff make you feel like family. They take any fear away once you walk through the door. Makes you want to stay longer and just visit and brag about your visit with other patients. Good experience; the staff was quite nice and helpful, looked up info and called insurance to prepare for my procedures I need before I made my decision of approval of items of procedures she suggested. My office was wonderful Dr Johnson and her staff are exceptional. I LOVE HER!!!!! And, trust me you will too! My experience at Today's Smile make every dental visit a pleasant one. She asked me what was my major concern, we discussed my history and my home routine that led up to the current issue. After carefully going over my history we came to the discovery of what caused my issue. At thatpoint she gave me options to try to resolve the issue and was more than attentive to follow up with me to make sure the resolution was satisfied. Dr. Johnson is professional, friendly and she knows her stuff. A joy every time I enter her building. The staff and herself are more than wonderful at what they do. Will definitely keep them as my dental preference. 10 stars!!! Outstanding! would be a pleasure to refer anybody to Quanda Jonhson! My visit was great! I highly recommend her to all of my friends and anyone who's in need of a dentist!! I love my doctor I would recommend her and her staff. They are very friendly and professional.